Any chance of getting a copy of this model so I could try it out on my 3d printer? Thanks, Jim---I've always liked that photo; here's a fresh copy of it from the book. I've wondered where on the house that corner exists or existed; the gable end fooled me. 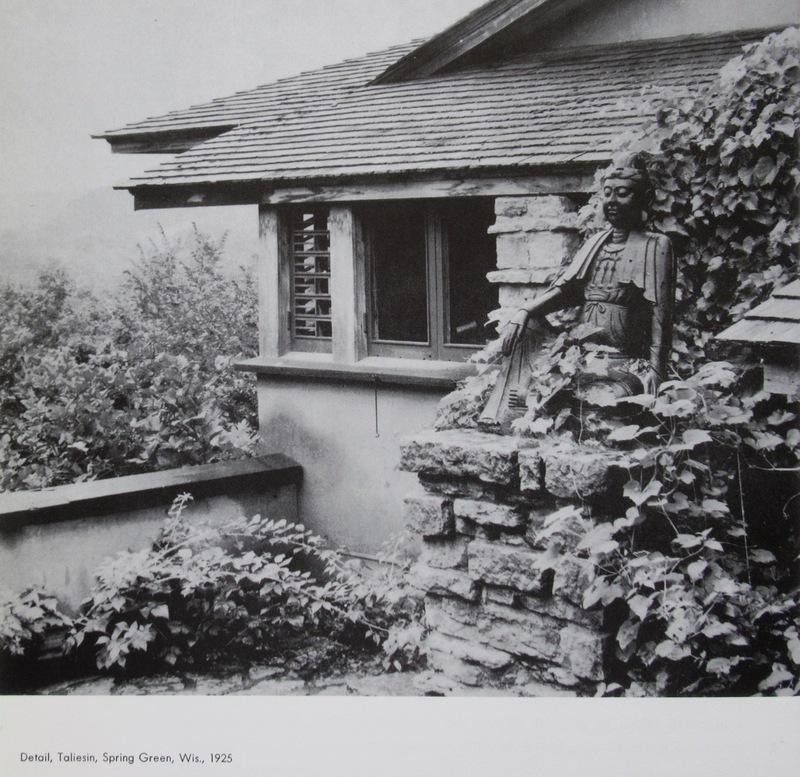 But that gable on the fireplace wall of the living room finally appeared, with Taliesin III---see last image below. 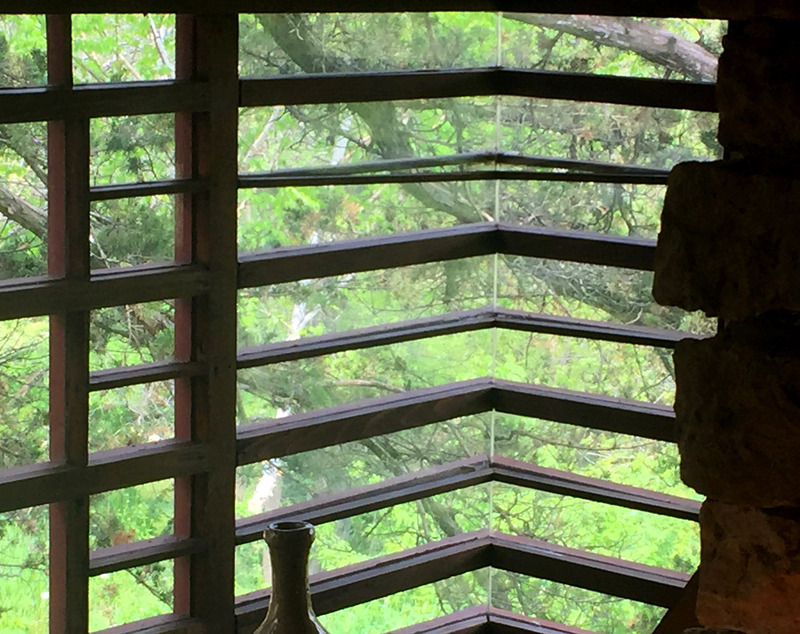 that detail to Taliesin's roofs---if and as become possible . . .
Mmm. That last picture could be . . . the same corner of the living room ? Or doesn't the cat have that many lives . . . It's also analogous to, say, the entry at Freeman: a passage through a short colonnade to an overlook, with the house and entry making themselves available at right . . .
Picture #1 is a revelation; a mitered-screen enclosure reminding one of Pope, of Lloyd Lewis, and of . . . Your second photo I have always paired, in my mind, with the one at the top of the page---and again I don't really know where it was shot. choices are ample evidence of natural growth---and shadows of same---gracing the work . . . and indeed shadows of any kind, animating (and decorating) the architecture---naturally ? 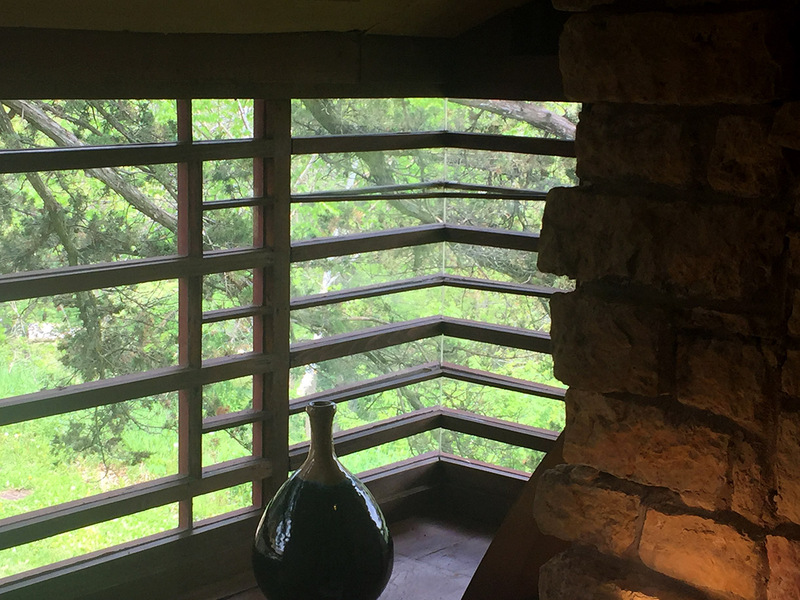 I'm thinking that possibly that photo immediately below the screened porch view is of FLW's bedroom terrace before he started extending it like a telescope. (That would put it in the vicinity of when Hedrich Blessing took that sweet batch of 1937 photos and FLW's bedroom had the roaring inferno in the fireplace and they had apparently moved the corner bed eastward so you could tell it was a bedroom.) If so, the photographer would be perched on Olgivanna's roof. Here's my snapshot of that window from the inside (taken 2 years ago). We may be able to infer how it is constructed -- we see part of one horizontal muntin seemingly detached and sagging. So, clearly that particular component was not integral to a window muntin between separate panes of glass. I'm thinking some of these horizontal elements are just applied over larger pieces of glass. Perhaps simply glued ? 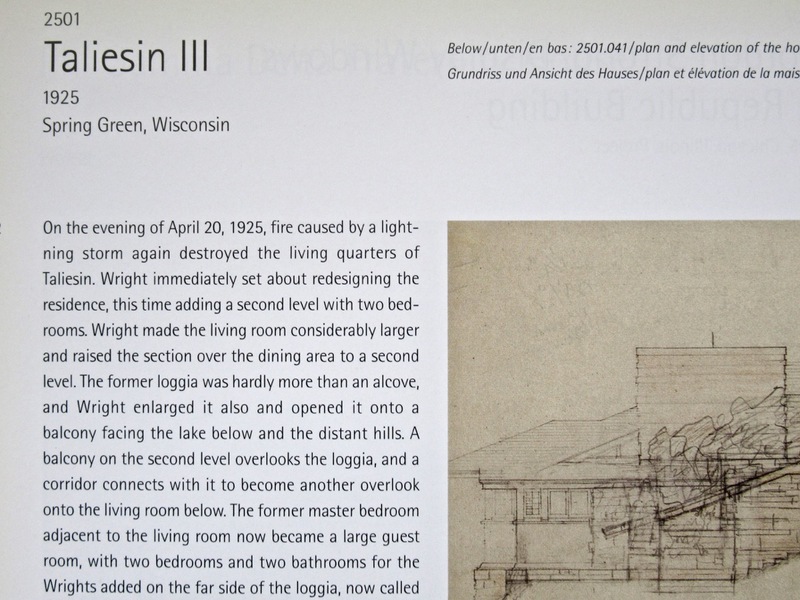 Also, if we look at those black & white images from the "American Architecture" book notice the view of FLW's bedroom terrace (the image directly after the screened porch photo). There is a large urn perched on the far right corner of the terrace railing wall. I think that same urn appears in my recent snapshot showing the entry stairs, just below the studio windows. Great stuff. I'm afraid that's exactly it: muntins glued to glass. If anyone doubts that Mr Wright might indulge in scenography---like some exalted architectural Hitchcock (Alfred, you know)---here's proof. I'm going to venture that the big oak in the 1912 photo, top of page, is the same one seen in the last monotone photo, above. Those are conifers in your first photo, above, no ? coinciding with what's seen in the exterior view ? seen exterior expression only of secondary concern ? 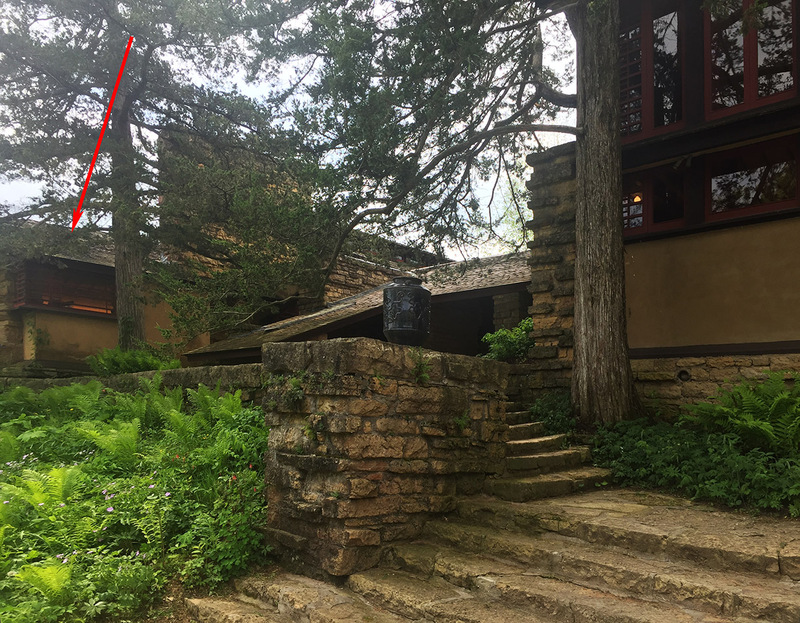 "It [the entry sequence at Taliesin] is also analogous to, say, the entry at Freeman: a passage through a short colonnade to an overlook, with the house and entry making themselves available at right . . . "
Pauson would be another example of this same sequence: move through an enclosure toward a vista, the entry portal found via a sharp right turn. Are there other structures which present this condition ? Although you hang a left instead of a right, the area between the tool room and the Winn House frames a grand view of the Parkwyn Lake. SDR... second photo (early Taliesin III?) is definitely Wright's relocated bedroom and terrace. The last photo is from the early Fuermann series of the living room. You have just emerged from the garden court via the covered loggia; moving to the right you would pass the fireplace to "front" door. Thank you. Wright dates that photo "1925"; that's correct, I presume ? 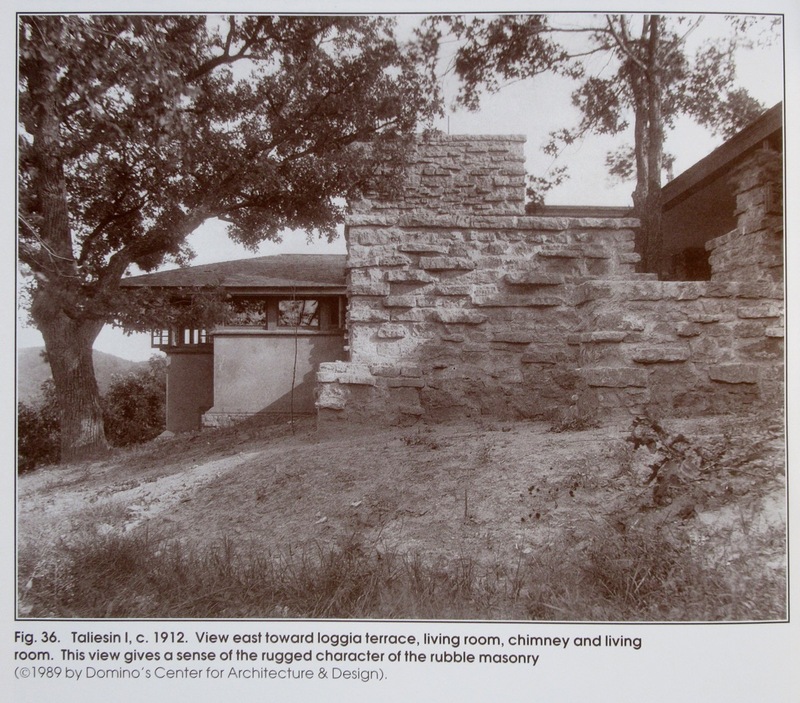 I've seen that it's convention for any photo showing the third version of Taliesin as given the date "1925", but that's most often not the case. 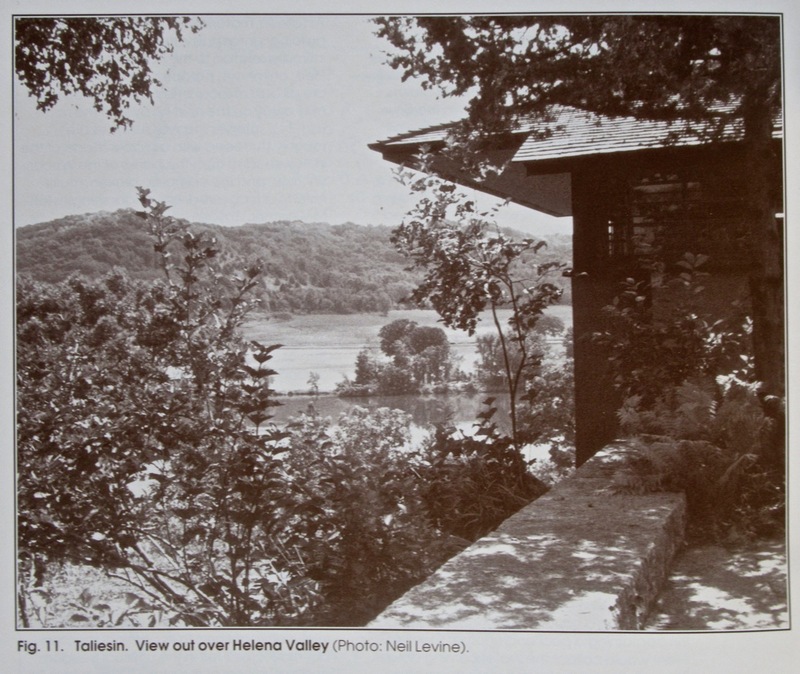 The photograph (of the two people under the old Porte-Cochere roof at Taliesin), is dated 1934-36. The beginning date is due to the roof on the upper left, which shows a construction change that took place 1933-34 (I don't know how far the construction was in the summer of 12933, but it was probably still rough looking). The 1936 date comes because, in the background, you can just see, to the left of the woman's hat, the edge of what would become Wright's bedroom in 1936. Then he moved there, his bedroom terrace was constructed, and you would have been able to see it.